Beth Daigle’s first foray from the world of magazine articles and blog content into long-form memoir is a recounting of her family’s two week long vacation in the Mediterranean in 2012. Daigle’s family of four, her parents, and her sister’s family traveled to Italy first, continuing on to Greek and Turkey via a cruise ship. The book itself, “MUSING MEDITERRANEAN” is billed as a transformative account of a woman with travel anxiety and a phobia of flying overcoming both and embracing the total travel experience. However, it falls short in part because, as readers will discover, the travel anxiety so heavily hinted at on the front and back covers is seen very seldom within the actual pages of Daigle’s account. 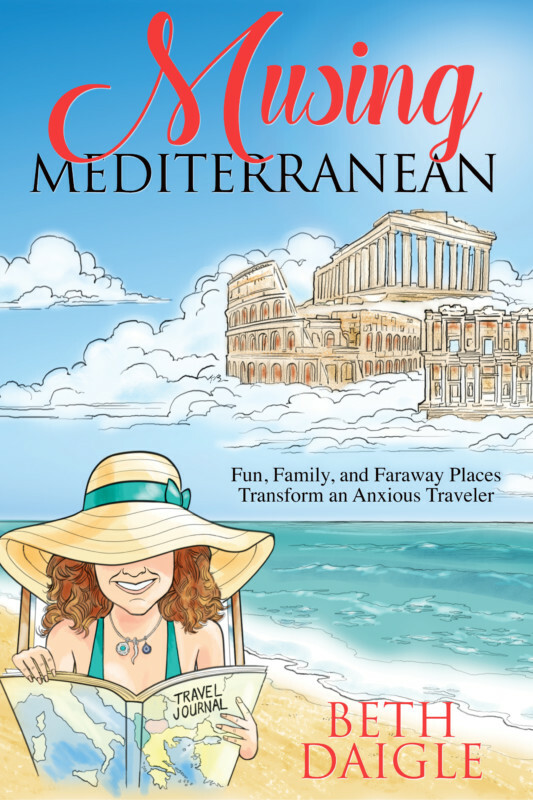 If you are a person with anxiety who finds themselves flustered at the thought of traveling long distances or with a large group, you might think from the description that “MUSING MEDITERRANEAN” will offer insight into some of the author’s own strategies to overcome such fears in order to immerse herself into her family vacation and fully enjoy it. But you won’t find many coping mechanisms in Daigle’s book. The travel anxiety portion of the memoir is covered almost entirely in the first few chapters, and Daigle’s method of handling it is to ignore the entire planning process and then down two glasses of wine before boarding the plane. Daigle imparts that her fear of flying developed post-9/11, but when she is actually on the plane that will take her and her family across the Atlantic Ocean, the only mention of anything even approaching anxiety is her irritation at an obnoxious child seated behind her. As told in the book, Daigle’s anxiety seems overblown in an attempt to distinguish her memoir from similar travel adventures penned by other writers. The highlights of “MUSING MEDITERRANEAN” are when Daigle goes into detail about her family’s daily excursions. These accounts are often broken down by specific landmarks or attractions, which makes the information especially useful for people who may be interested in planning a Mediterranean excursion of their own. Daigle mentions especially good tour guides and restaurants by name, so you could replicate her experiences if you wanted to. The travel log aspect of “MUSING MEDITERRANEAN” is by far the most appealing in the book as a whole. The family dynamics are occasionally referenced, but other than Daigle’s sister, most of the other members of her tribe don’t get a lot of page time. Daigle also spends a fair amount of time complaining about mostly insignificant things. These annoyances include not finding a chair at the pool, her husband and brother-in-law spending too much time in the cruise boat’s casino, and her sister not preparing her fully enough to sit through a harrowing screening of “The Girl with the Dragon Tattoo.” Unfortunately for Daigle, these sometimes long diatribes don’t impart much sympathy on behalf of the reader. “MUSING MEDITERRANEAN” is a fine book for readers seeking to hear a personal account of excursion experiences in Italy, Greece, and Turkey, and who may be looking for specific recommendations for what to do and see off the web pages of Yelp or Google. However, for those seeking a heartfelt memoir or revealing transformation achieved through travel, there are likely better options available. “MUSING MEDITERRANEAN” is available at Head House Books, Joseph Fox Bookshop, Penn Book Center. You can read more about the author at her website. Published by Kelley & Hall Book Publicity.